ICYMI – GUEST ARTICLE: The Return of The Heavyweights? In November of 2015, a young, rising, strong, tall, slightly off his rockers, trash talking boxer with all the wit and charm of a maniacal anti – hero finally received his shot in a heavyweight title showdown for the WBA (Super), IBF, WBO, IBO, Lineal and The Ring Magazine Heavyweight titles, against a solid, tactical and methodical, Wladimir Klitschko. That man was, Tyson Fury. Tyson Fury went on to defeat Wladimir in a 12 round UD bore fest. The fight was overtly cagey, dull and had Klitschko dumbfounded for 12 rounds to Fury’s fast faints and even faster jabs. Tyson went on to become the unified world champion and lineal champion that year, solidifying his place in lineage history. Almost 3 years on, Fury has had no training, he’s been addicted to drugs and sweets. But alas finally, the man is back in the gym and in training camp for good after finally being informed that he would be stripped off his lineal belt if no fight occurs within the next few months of this year. I suspect that this has finally garnered Fury’s attention and my instincts tell me that he may be back in the ring for good within the next few months. Furthermore, during his absence, Anthony Joshua (AJ) has gone on to become the King of the division with excellent and exceptional skills in the ring, besting Klitschko in what I think has been the best heavyweight fight in almost a decade since Vitali fought Lewis that ended in a stoppage. Who knows what could have happened had a rematch occurred but I digress. Now let’s not forget while AJ may be dubbed the King of the division, there are two other stand out heavyweights that hold portions of the belt. They’re 2 solid fighters with very different fighting styles. Deontay Wilder and Joseph Parker. Deontay Wilder has the ability and agility to beat the above 3 and quite frankly, I think he is the only one who can accomplish that feat barring Wilder going all out into the Wilderness with his erratic style fighting. Deontay Wilder’s fight style is very reminiscent of Max Baer who lost in an upset fight to Jim Braddock aka Cinderella Man. The punches Deontay throws are almost identical as to those of Max Baer and the resemblance is uncanny. This raises a chink in Deontay’s armour aside from having not that many BIG name fights on his resume even though he’s had about 39 fights now. The question is, is he too wild, erratic and agile that he may slip and create an opening for a powerful shot to the body by who I think is the strongest in that area, i.e. Joseph Parker. Parker is set to fight AJ this March for the IBF and WBO titles. 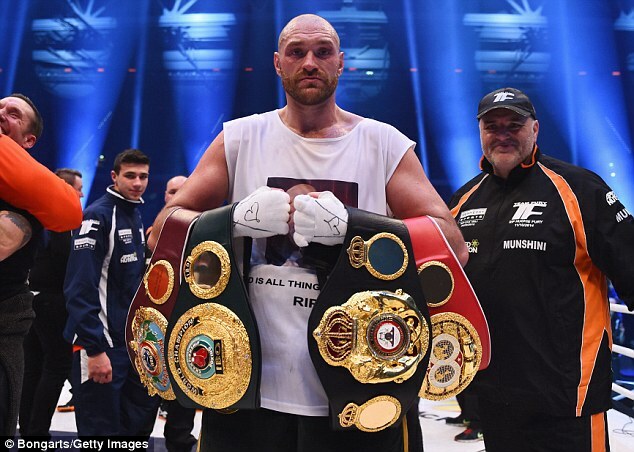 3 years since Fury shattered Klitschko’s heart and AJ cementing the man’s retirement we now find ourselves in a situation where the heavyweight division is finally making some noise again. And it is lusting for action. The division has finally decided to march on and this March a chain of events will be set in motion as to who fights who and who fights for what reason. In my opinion, as far as I’m concerned, these are the 4 top heavyweights right now that the public will bother to fill the stadium to watch and these 4 will all beat and lose to each other at one point in their careers and could each go down in history as the best 4 heavyweights of this era but only ONE can reign supreme. So who will it be? My instincts tell me that the following fights take place at some point if the boxing cosmos stars align. Let’s put aside the upcoming March fight with AJ AND Parker just for a moment. We have Deontay Wilder, Joseph Parker, Tyson Fury and Anthony Joshua. I believe that the victories and losses will go as follows. Deontay loses to Parker. Fury loses to Deontay. AJ loses to Fury and Parker loses to AJ. And then it’ll be a reverse where they will all go on to regain their belts and avenge their losses. So who will end up as the best of their era between the best 4 of this era? Only time will tell and perhaps one day they’d all become friends and have a laugh about their fights on a chat show but for now, all four are hungry and thirsty for blood. I can safely say that 2018 will be the year that the heavyweights take their rightful place at the top of the division as they should. Royalty will make an appearance but which King will take his place on the throne to heavyweight supremacy? Who knows, this could bring Bellew into the mix and if Luis Ortiz who I don’t think deserves to be mentioned much due to his constant drug issues. Then you have your Dillian Whyte’s who could create an upset but unless there is a fighter willing to step through a stepping stone that they refuse to step on, Whyte and Bellew might have to take a fight to themselves and maybe then, just maybe, we’ll have some frequent bouts of angry and crazy boxers going wild.